Scientists have found that Native American populations - from Canada to the southern tip of Chile - arose from at least three migrations, with the majority descended entirely from a single group of First American migrants that crossed over through Beringia, a land bridge between Asia and America that existed during the ice ages, more than 15,000 years ago. "For years it has been contentious whether the settlement of the Americas occurred by means of a single or multiple migrations from Siberia," said Professor Andres Ruiz-Linares (UCL Genetics, Evolution and Environment), who coordinated the study. "But our research settles this debate: Native Americans do not stem from a single migration. 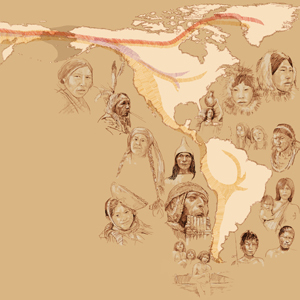 Our study also begins to cast light on patterns of human dispersal within the Americas." "There are at least three deep lineages in Native American populations," said co-author David Reich, Professor of genetics at Harvard Medical School. "The Asian lineage leading to First Americans is the most anciently diverged, whereas the Asian lineages that contributed some of the DNA to Eskimo-Aleut speakers and the Na-Dene-speaking Chipewyan from Canada are more closely related to present-day East Asian populations." Two striking exceptions to this simple dispersal were also discovered. First, Central American Chibchan-speakers have ancestry from both North and South America, reflecting back-migration from South Americaand mixture of two widely separated strands of Native ancestry. Second, the Naukan and coastal Chukchi from north-eastern Siberia carry 'First American' DNA. Thus, Eskimo-Aleut speakers migrated back to Asia, bringing Native American genes. The team's analysis was complicated by the influx into the hemisphere of European and African immigrants since 1492 and the 500 years of genetic mixing that followed. To address this, the authors developed methods that allowed them to focus on the sections of peoples' genomes that were of entirely Native American origin. "The study of Native American populations is technically very challenging because of the widespread occurrence of European and African mixture in Native American groups," said Professor Ruiz-Linares. "We developed a method to peel back this mixture to learn about the relationships among Native Americans before Europeans and Africans arrived," Professor Reich said, "allowing us to study the history of many more Native American populations than we could have done otherwise."